Archibald McLarty emigrated to the promised land of Canada from Argyll, Scotland, with his wife and four children, arriving in Quebec on August 27, 1831. The family then made their way to the Fingal area, where Archibald lost no time filing his application to secure land through Colonel Talbot. Concession 6, Lot 15, Howard Township was accessed in 1832, although it wasn’t until 1847 that he completed his settlement duties and was ready to pay the fees to secure the land. While the original homestead is to the East on McLarty Line, Ken’s grandfather began farming at this location in 1917. Ken is the fifth generation McLarty farming in this area. He and his wife Sue have lived here since 1975. Their quilt honours the descendants who made the perilous voyage across the ocean to build a future in Canada. 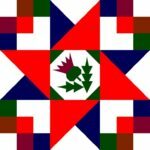 This quilt pattern was designed by Ken and Sue’s son, Tim. The Scottish thistle represents the family’s roots and the colors— red, green and blue —are inspired by the tartan of the McDonald clan, from which the McLarty clan descended.